Welcome ladies and gentlemen to another day into the world of “Writers Noir.” Straight out of the pulp comic book library I introduce to you “Lobster Johnson: The Prayer of Neferu.” Imagine if the personalities of Captain America and the Punisher were wrapped into one, the ideas of freedom and justice twisted within the ideas of vengeance? 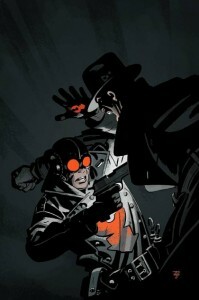 You would get “Lobster Johnson” a gunslinging vigilante, that’s out to spread his version of justice through bloodshed. Mike Mignola the writer behind books like: HellBoy, WitchFinder, and the B.P.R.D series bring us a pulp/action book that’s just all around fun. Lobster Johnson’s origin story is an unique one. The pulp style hero, first appeared as a comic book character HellBoy would read about as a child. It didn’t take long for Lobster Johnson to make his appearance in an issue of Dark Horse Presents. Giving readers a glimpse as to what was to come from the bloodthirsty vigilante. 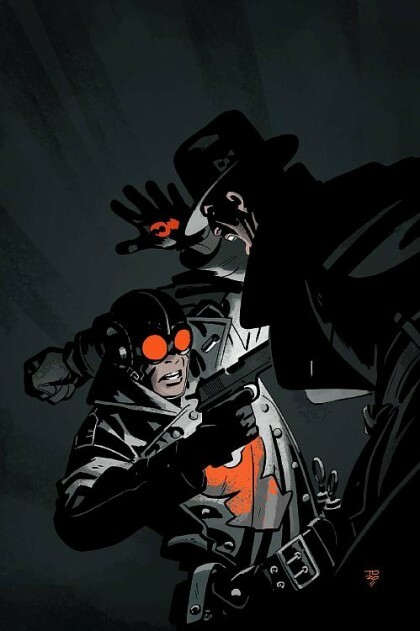 Lobster Johnson: The Prayer of Neferu is a straightforward action packed book set in the 1940’s. Like most of Mike Mignola comics, there’s always the supernatural element of his storytelling. Next to taking down occasional thugs of the 1940’s, our hero has his share of demons and ghosts he has to vanquish. Mignola also captures the perfect example of dorky dialogue set for a 1940’s hero “Feel The Claw!” ( Lobster Johnson: The Prayer of Neferu). the artwork done by Wilfredo Torres is smooth and refreshing for a pulp style comic, which easily helps tell an action based story with little dialog. Overall Lobster Johnson: The Prayer of Neferu is a fun comic, with no complaints in my book. The Prayer of Neferu is only a one shot, and if you happen to pick up this book and enjoy it, the Lobster Johnson: Iron Prometheus trade is currently out, along with another trade Lobster Johnson: The Burning Hand coming out November 27. This entry was posted in Columns and tagged bprd, Captain America, hellboy, iron prometheus, lobster johnson, Mike Mignola, punisher, the prayer for neferu, witchfinder, writers noir. Bookmark the permalink. Follow any comments here with the RSS feed for this post. Post a comment or leave a trackback: Trackback URL.